Does The Mustache Belong In Today’s Work Environment? I can’t believe it has been more than 8 months since my last blog. During that time, there has actually been a lot going on with PPM. We’ve hired 4 new employees, revamped a bunch of our internal systems, and completed some really amazing As-Built projects. But as newsworthy as all of these things were, it took something really special to finally get me to fire up the word processor and write about it. 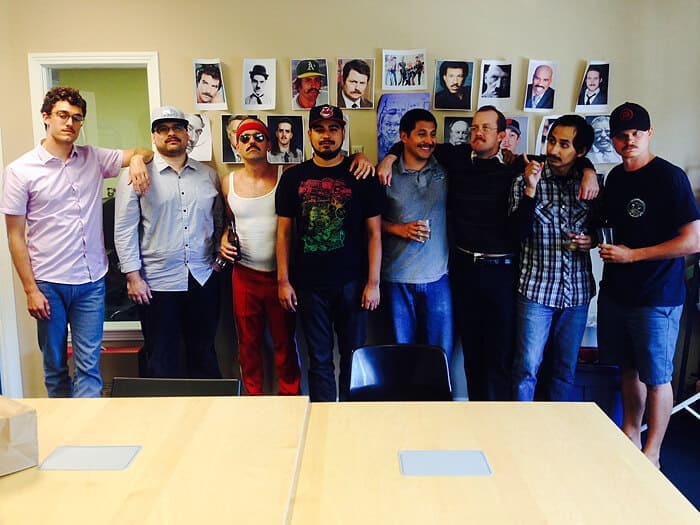 We had just such an occurrence last month: PPM’s first (and hopefully not last) mustache growing competition. Like many great events, it all started with a man and a dream. Colin Maloney is always looking for a challenge. When he’s not expertly As-Built surveying a custom split-level residence, he needs something else to get his adrenaline flowing. Fortunately for Colin, the rest of us here at PPM are always looking for something fun to do at work. So when Colin asked if anyone wanted to grow a mustache during the month of May, there were 8 takers. The competition was on. Participants were required to arrive to work clean-shaven on May 1st. For the next 4 Mondays, as the contestants sauntered into the office after a long and intense weekend of new hair growth, we would all spend a few minutes (OK or maybe an hour) comparing each other’s progress, and then take a photo for the official record. Rules were posted in the office halls, a judging scorecard was created, and an esteemed panel of mustache judges was chosen including PPM employees and special guest judge Mac McFarland (my father), he with 45 years of unblemished first-hand mustache experience. Friday May 30 – Judgment Day. The tension in the office was so thick you could cut it with a tape measure as we all tried to get our work done before the 3PM judging. A random order was chosen, and then contestants were led one at a time into the conference room to face (literally) the panel of judges. We were judged on 5 categories of mustache characteristics (Style, Thickness, Scummyness, Filthyness, and Authoritative Presence), as well as by our answers to 4 mustache-related questions of great societal importance. To enhance their overall aura of mustachiousity, several contestants wore themed costumes and assumed an alternate identity. After each mustache had its opportunity to be seen, heard, and felt, the judges took a good 15 minutes or more to deliberate. Heated arguments could be heard all the way across the building, and at one point I’m pretty sure a chair was thrown. When the dust settled, a winner was declared: Colin Maloney (a.k.a. Ned Flanders) had prevailed. Placing second was Cameron Slatterbeck (the redneck) and in a tie for third was Mike Valencia and Taylor Ferry. When it was all over, the 7 losers took turns and carried the winner on our shoulders from the office about ½ mile up Anaheim St. to our favorite neighborhood watering hole, Roundin’ Third. There, each mustache celebrated its hard work by soaking itself repeatedly in ale. Mustache May was an unqualified success for PPM. Be on the lookout for a mustachioed As-Built Surveyor in your neighborhood in May 2015!